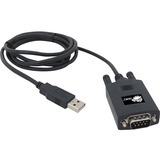 SIIG's USB to Serial-Value is designed to instantly add an additional RS232 9-pin serial port to your computer via an available USB 1.1 or USB 2.0 port. The USB to Serial-Value adapter supports data transfer rates up to 230 Kb/s and works flawlessly with RS232 serial devices such as modems, ISDN terminal adapters, PDAs, bar code scanners, label printers, and many more. The USB to Serial-Value adapter is fully compliant with USB specification, revision 1.1, comes with FCC Class B (DoC) and CE regulatory approvals and meets RoHS hazardous materials standards. Additionally, it is fully compatible with a wide variety of Windows operating systems and is backed by SIIG's limited five year warranty.